In case you didn't see the promo go up yesterday, I was invited on my buddy Hab Oh's podcast/talkshow, Fringe to the Future!. Hab, Pilar Newton-Katz and I talked about comics, industry, female representation, Korra, and more! But today's page, wow. I wonder what's in that needle! ...ok, no, I don't wonder. I know. Hopefully you all see where this going--and that's not to a good place! In exciting news, we've reached the SECOND Patreon goal! Thanks to 9 wonderful patrons, you all get treated to an extra monday update each month we remain at the milestone mark ($50/month). The first one will be up on September 1st. Two more portraits were added to the thank you page, and only two more to go! 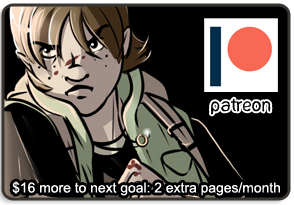 If the THIRD patreon goal is met (100/month), that's another extra update each month! 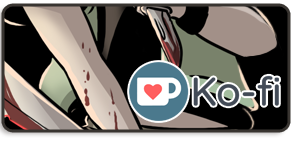 Remember, if you give even $1/month, you get access to the patron-only activity feed, which means you get to see pages early!